Okay kids, my problem with these starter kits is well-documented. They're garbage. If you want to get started in golf, I recommend you invest in some decent "sticks" that you won't grow out of in a few months. 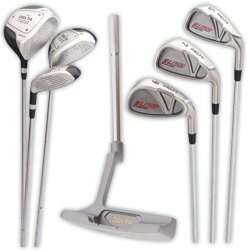 Take a look at the Adams Golf A2 Irons. These are very forgiving clubs that you will learn to hit very quickly. Trust me; with these clubs and a little practice, you will get the ball airborne in no time. What's more is, they are of high quality and will continue to compliment your game as you progress.